This chicken salad with grapes and pecans is quick, delicious, and satisfying… A simple 6-ingredient recipe that makes the BEST chicken salad sandwich! This is a sponsored conversation on behalf of The Coca-Cola Company; all opinions and text are my own. Thank you for supporting the brands that support this site! Growing up, chicken salad wasn’t really on my radar. We did a lot of tuna salad, along with this classic egg salad recipe after Easter — but never chicken salad. It wasn’t until my then future husband and I started frequenting a quaint little restaurant near my dad’s Lake Erie cottage that I fell in love with it. This restaurant was well known for two things: the most amazing fresh cut French fries (seriously SO good!) and the very BEST chicken salad. No joke — after trying it just once, I ordered the chicken salad (with the fries, of course) nearly every time we visited. Oh, and they had drool-worthy homemade pies, too… I may have gained a few pounds that summer, LOL! I’m not a huge mayonnaise fan (although I do like a good homemade mayo), so I prefer to swap half of the mayonnaise for Greek yogurt when I’m making it. This hack does the double duty of lightening up the recipe a bit, while adding a little extra protein at the same time. I highly encourage you to try it! I promise, you won’t even miss the full-on mayo. Chicken salad is fabulous for feeding a hungry crowd all summer long — and budget friendly when you pick up your ingredients at Sam’s Club. I used the Member’s Mark canned chicken breast to make this recipe in a hurry, and it’s totally delicious. High quality canned chicken breast is hard to come by, and this one totally makes the cut in my book. On this most recent trip, I also picked up some Hubert’s® Lemonade as a special treat for my youngest daughter. She adores lemonade, and you can frequently find her in my kitchen making a homemade lemon shake up, so her eyes totally lit up with I walked in with it. Hubert’s® is truly “happiness in a bottle.” She’s happy to have a refreshing sweet and tart beverage, and I’m pleased because I know it’s made with natural flavors and cane sugar. And because my kitchen stays a little cleaner, LOL… I get major Mom bonus points whenever I come home with Hubert’s! This easy chicken salad recipe with grapes makes a BIG batch, which is perfect for our larger family (or when you’re hosting guests). But even if you’re not, the full recipe only gets better as it sits. It’s just as tasty the next day, as it is when it’s fresh! Chicken salad is very filling, so we typically keep our sides minimal. If you get a large bunch of grapes, just serve whatever you don’t use in the salad alongside of your sandwich. Pretzel chips are always a great addition to sandwiches, and you can grab a huge bag of them for a steal at Sam’s Club, as well. I’m ALL about no-cook summer meals made simple, and this is about as easy as it gets! PIN IT NOW! CLICK HERE TO ADD THIS EASY CHICKEN SALAD RECIPE TO YOUR EASY RECIPES BOARD ON PINTEREST! This chicken salad with grapes and pecans is quick, delicious, and satisfying... A simple 6-ingredient recipe that makes the BEST chicken salad sandwich! In a medium mixing bowl, shred the drained canned chicken with two forks. Add the celery, mayonnaise, Greek yogurt, roasted pecans, salt, and pepper, and mix well to combine. Gently fold in the diced grapes. Serve on croissants, toasted bread, crackers, or lettuce, as desired. Topped with blue cheese, celery, and blue cheese dressing, this buffalo chicken pizza recipe is a real winner. Paired with your favorite side salad, it’s sure to fire up your next pizza night! Packed with loads of mixed veggies and diced canned chicken breast, these 4-ingredient mini chicken pot pies are a fantastically quick and easy weeknight meal… I love baking them in individual ramekins for easy serving! This easy buffalo chicken dip recipe will blow your guests’ minds at your next tailgate or homegate… Just six ingredients and you can make it in the oven or the crockpot! I’d love to see how your chicken salad turns out… Tag me @Unsophisticook on Instagram or use the hashtag #Unsophisticook so I can check it out. Enjoy! We must be thinking alike! I make this the same way and I also added a granny Smith apple finely diced to the mix! Was so yummy and I am thinking about adding a handful of cranberries for some extra tart as well. Funny enough I am drinking lemonade too haha I enjoyed your post and appreciate fast easy meals when I can do them! Love these ideas, Jennifer! I’m going to try adding some green apple and cranberries next time I make it. This looks so good!!! I’ll take mine with a side of fries too! I love the idea of grapes and peanut in the salad to add lots of extra flavour. 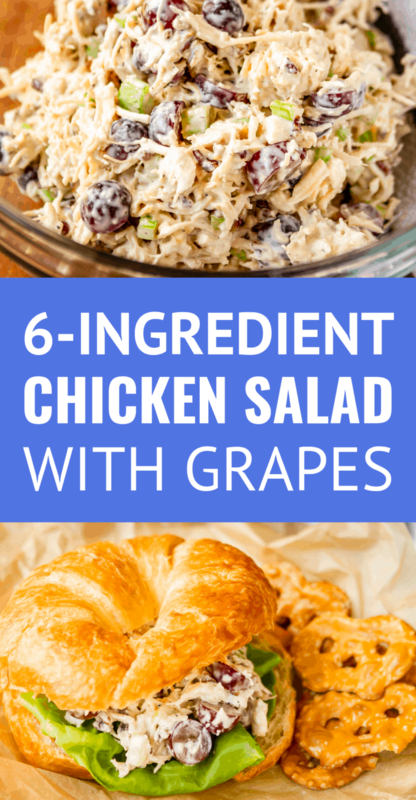 Love chicken salad and this one with the crunch of pecans and sweet grapes sounds delicious! Oh my goodness, so many good tips for making chicken salad! I don’t know why I don’t use pecans in mine! I also need to try it with canned chicken and definitely some of that yummy lemonade. I am so scared of canned chicken, I have to admit LOL. My sister in law made chicken salad with grapes in it once and I loved that burst of freshness. This looks so yummy on the croissant. Nothing to be scared of! Especially with the Member’s Mark brand — it’s super high quality. I think once you try it, you’ll love how easy it is to use in a variety of recipes! I love chicken salad that has grapes and pecans! It makes for the best flavor! I really loved how easy and tasty it is! Thanks for the recipe! Whoa I love that you added grapes and pecans! YUM! I’ve been looking for a delicious chicken salad recipe with grapes!! Thanks for sharing! Love the crunch of the roasted pecans in this recipe! Such a great way to supe up canned chicken! This is my favorite chicken salad recipe! So good. Now I just need to try that lemonade! I had chicken salad for the first time EVER two days ago and thought I’d try to make it at home for the bf and I. This is the recipe that looked the simplest so thought I’d try it however, I tweeted a few things. I used rotisserie chicken, left out the celery, since my bf and I aren’t fans and it was STILL fantastic! (I think the crunch of the pecans was my favorite part.) Oh and I tried toasting the pecans for five min like the recipe said…NOT a good idea. I dropped it to 350 for three min and it was perfect! Def gonna be a recipe I’ll make again! So happy to hear that, Mindy! Yeah, nuts can be a little finicky. It depends a lot on their size and varies by type, too. It’s definitely a good idea to keep a close eye on them. My basic rule of thumb is when I can smell them, they’re done. Too heavy on the mayo but otherwise good! Thanks, Nicole! You can easily cut back on the mayo and/or the Greek yogurt to fit your tastes. Try reducing each to a half cup and see if that works better for you. What flavor Greek yogurt did you use? Hi Hope! I just used the plain variety.